Even if you aren’t a fan of Harley-Davidson’s range of cruisers, you can’t fail to be impressed by the V-Rod. When this muscle cruiser arrived in 2001, powered by a water-cooled engine no less, it was like a bolt from the blue. Early V-Rod models arrived in a stunning brushed aluminium finish which when combined with the solid wheels and twin stacked pipes made the bike look amazing. These are still (arguably) the best looking of all the V-Rod’s many incarnations and with the V-Rod now discontinued from Harley’s range, you have to be thinking of early generations as potential future investments. 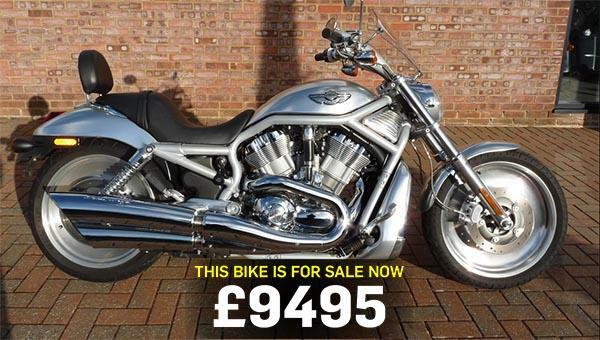 You can see this Harley-Davidson and find more V-Rod models for sale here.